Hi everyone! I wanted to pop in to say Merry Christmas and to share one final card for the year. It isn’t Christmas-themed but friendship. I’ve made so many friends through this craft and I am thankful for every single one, near and far. 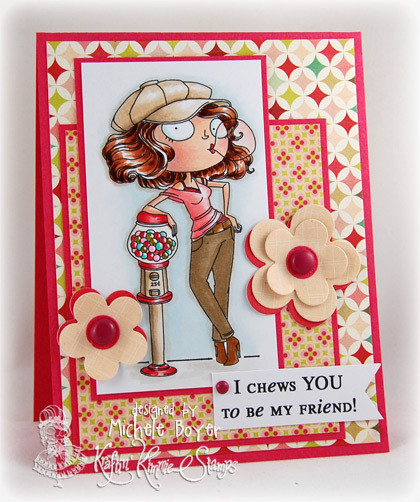 Today I’ve used Friendship is Tweet from Kraftin Kimmie Stamps. 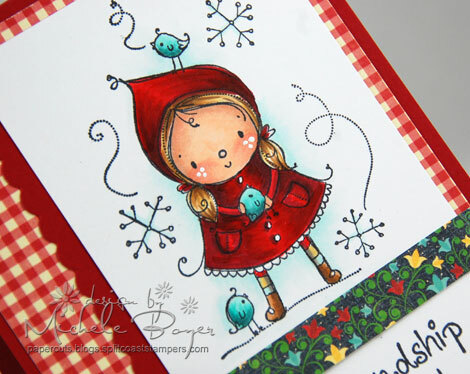 I stamped onto X-Press It Blending Card and colored with Copic markers. To add dots to the cheeks, I used Copic Opaque White and a tiny paint brush. I hope you have a wonderful holiday. Hugs! 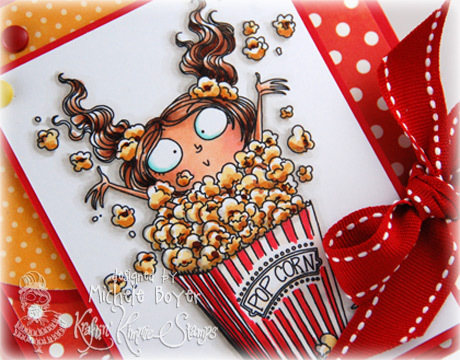 Welcome to Kraftin Kimmie Stamps‘ October release! We have lots of fun new images this month. Cheryl has created two of the most adorable sets featuring two new winter cuties, Emilie Goulet presents a cute new baby set and Annie has six new Dashing Dancers. There are new Winter Trinkets designed by Nicole Aspinall as well. You’ll see most of the new images throughout the hop. Click on the little frog below to see a list of direct links to all Krafty Girls and Guests. 🙂 Be sure to leave comments as you go because two lucky winners will each receive a package of assorted stamps from the release! 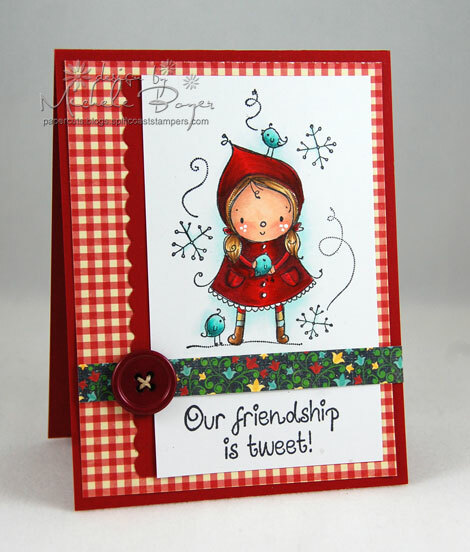 Today I’ve used one of Cheryl’s cute images from Lexi’s Winter Fun. As always, I colored with Copics, choosing to “dot” in color on the coat trim to (hopefully) create a bumpy-like appearance. 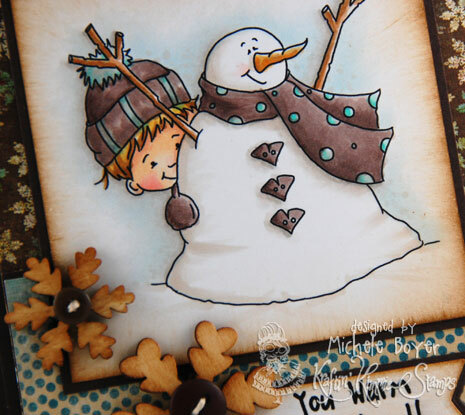 Stamps: Kraftin Kimmie Stamps “Lexi’s Winter Fun” (Cheryl Alger Designs) Ink: Memento Tuxedo Black, Ranger Antique Linen Distress Paper: Stampin’ Up! 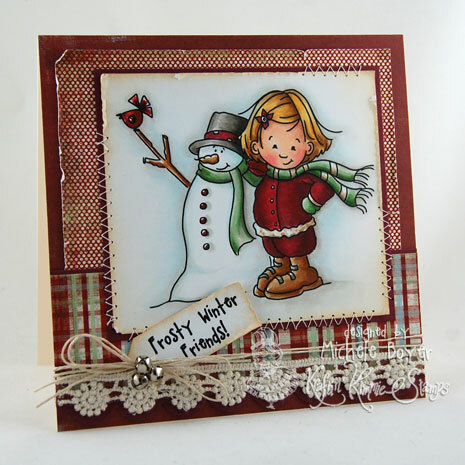 Bravo Burdundy, X-Press It Blending Card, My Mind’s Eye “The Merry Days of Christmas” (6×6), Papertrey Ink Vintage Cream (base) Accessories: Copic markers (E00, E11, E13, R20, Y21, E31, E35, YR23, R37, R39, E09, YG61, YG63, YG67, BG70, W00, W1, W3, W5, W7), My Favorite Things Simply Scallops Die-namics, Recollections Lace on a Roll, 6mm jingle bells, hemp cord. Finished size 5″ x 5″. 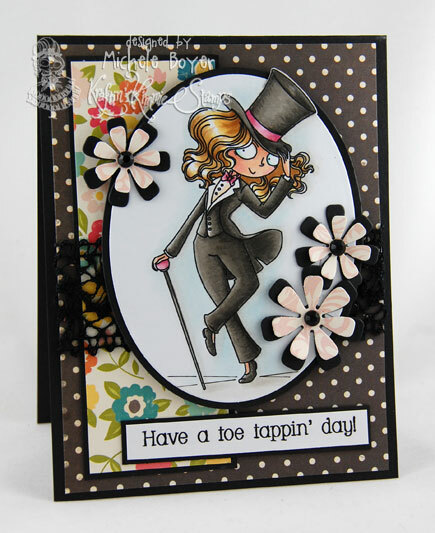 Have a Toe Tappin’ Day! I’m back today with the Krafty Girls sharing samples of new Moonlight Whispers images from Kraftin Kimmie Stamps! These dancing divas will be available with the October 21 release. You can find a list of direct links to more samples by clicking on the little frog toward the bottom of this post. Be sure to leave comments as you look because two lucky winners will each receive three of the new images! After coloring with Copics, I die-cut my image and layered the flowers, adhering black rhinestones in the flower centers. Be sure to click the frog below for links to other Krafty samples and your chance to win three new Moonlight Whispers images! I’ll be back tomorrow for Kraftin Kimmie’s October release hop. 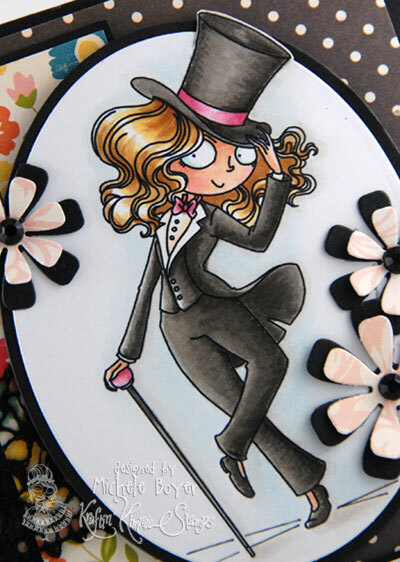 Stamps: Kraftin Kimmie Stamps “Trixie Tapper” (Moonlight Whispers) Ink: Memento Tuxedo Black Paper: My Favorite Things Black Licorice, X-Press It Blending Card, October Afternoon Woodland Park (8×8) Accessories: Copic markers (E00, E11, R20, Y21, E31, E35, W00, W1, W3, W5, W7, R81, R83, R85, E51, BG11), My Favorite Things Oval STAX 1 & 2 and Flower Trio, May Arts trim, Recollections rhinestones. Finished size 4 1/4″ x 5 1/2″. 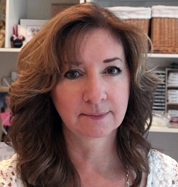 On Sunday, October 21st Kraftin Kimmie Stamps will release Lexi’s Winter Fun and Snow Day Lucas, two new sets illustrated by Cheryl Alger. Each set comes with three adorable images and coordinating sentiments. The image I used today is from Snow Day Lucas. I think he’s SO darn cute peeking from behind the snowman! I colored with Copics then sponged the edges with Ranger Walnut Stain Distress ink. I sponged the ink onto the wooden snowflakes as well, sweeping the ink along the grain of the wood. You can find direct links to more sweet samples by clicking on the cute frog below. Be sure to leave comments as you look because TWO lucky winners will each receive one of these two adorable sets! 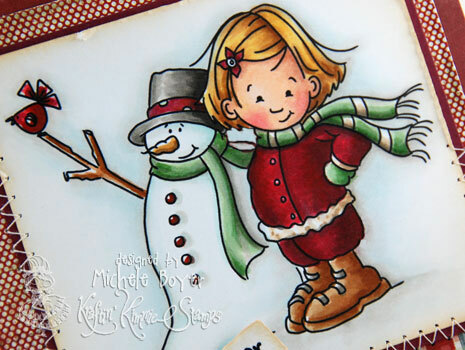 Stamps: Kraftin Kimmie Stamps “Snow Day Lucas” (Cheryl Alger) Ink: Memento Tuxedo Black and Ranger Walnut Stain Distress Paper: My Favorite Things Hot Fudge, X-Press It Blending Card, My Mind’s Eye “Signature Christmas” (6×6) Accessories: Copic markers (E50, E51, E11, R20, Y21, E31, E35, BG10, BG11, BG13, E70, E71, E77, YR21, YR14, E40, W00, W1, W3, BG70), Maya Road Vintage Wooden Snowflakes and pom-pom trim, My Favorite Things Hot Fudge buttons and hemp cord. Finished size 4 1/4″ x 5 1/2″. 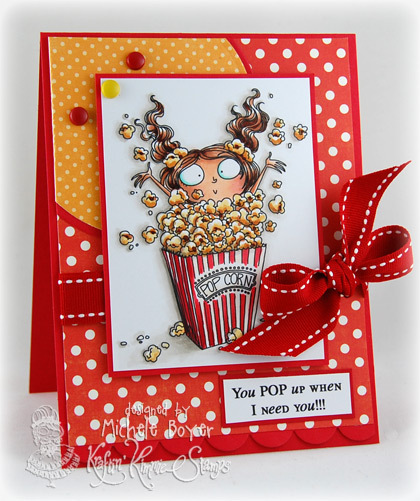 Welcome to Kraftin Kimmie Stamps‘ September release! 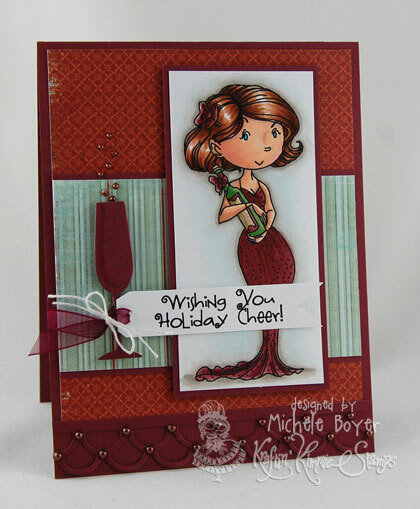 We have lots of holiday fun this month… Cheryl Alger has created an adorable Holiday Lulu and Libby set. Following along with the same theme, Emilie Goulet and Annie Rodrigue each have six adorable new images. And, of course, there are new Holiday Trinkets designed by Nicole Aspinall. Here I’ve used Deck the Halls. Isn’t he cute? I colored with Copics and then, even though you can’t see the sparkle here, I’ve gone over each bulb with coordinating Spica glitter pens. 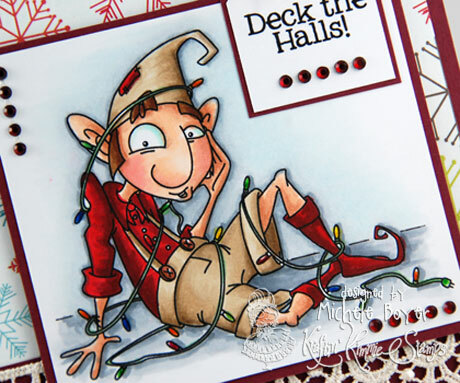 Stamps: Kraftin Kimmie Stamps “Deck the Halls” (Emilie’s Etchings) Ink: Memento Tuxedo Black Paper: Stampin’ Up! Bravo Burdundy, X-Press It Blending Card, My Mind’s Eye “Winter Wonderland” (6×6) Accessories: Copic markers (E00, E11, E13, R20, E17, E39, E42, E43, R27, R39, R89, YG45, B28, Y06, YR18, G14, C00, C1, C3, BG70), ribbon, hemp cord, lace trim, Michaels rhinestones, X-Press It 1/4″ foam tape. Finished size 5″ x 5″. Hi everyone! I’m back with another sample from Kraftin Kimmie‘s September release. Today the Krafty Girls and Guests are sharing previews of Annie’s six new Moonlight Whispers images. Not only is it a preview day, but it’s also Challenge Day. 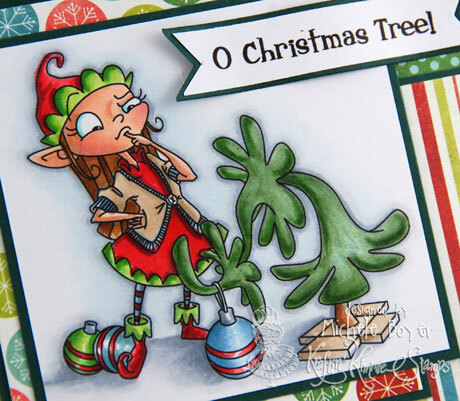 You can check out this week’s sketch HERE on the Krafty Blog. 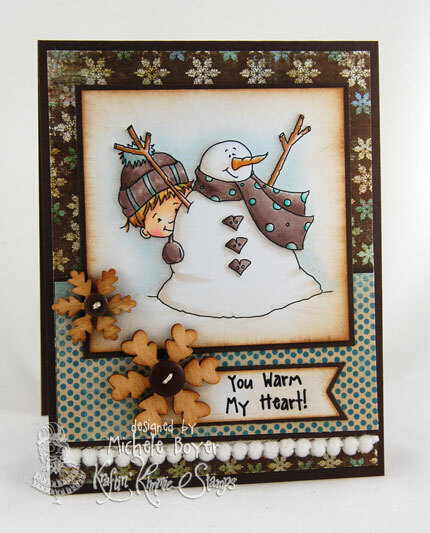 Create a card using any KKS image and post a link to your creation there on the Krafty Blog for your chance to win Grace from this release. 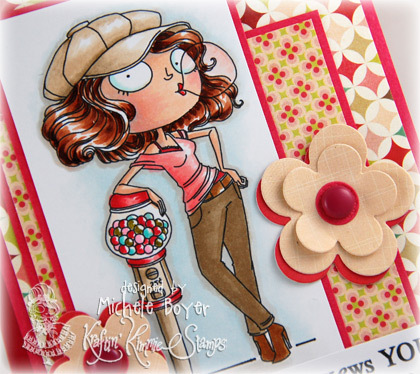 I’ll be back tomorrow (9/16, 1 a.m. EST) with Kraftin Kimmie’s September Release Hop & Shop. Thanks for stopping by! Stamps: Kraftin Kimmie Stamps “Nettie” (Moonlight Whispers) Ink: Memento Tuxedo Black Paper: Stampin Up Bravo Burgundy, X-Press It Blending Card, My Mind’s Eye “The Merry Days of Christmas” (6×6) Accessories: Copics (E00, E11, BV000, R20, E13, E15, E18, R56, R59, E42, E43, YG63, YG67, W00, W1, W3, BG70, Chocolate Spica glitter pen), My Favorite Things Let’s Toast and Double Scallop Border Die-namics, Amuse chocolate pearls, X-Press It 1/4″ foam tape. Finished size 4 1/4″ x 5 1/2″. Hi everyone! 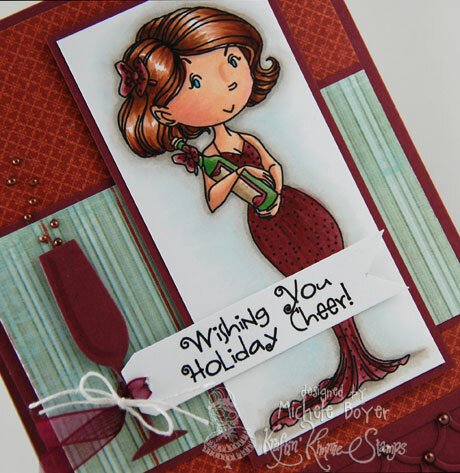 Today Kraftin Kimmie Stamps is previewing six new holiday images from Emilie’s Etchings. Each one comes with a coordinating sentiment and will be released Sunday, September 16. I colored with Copics and used fun new holiday paper by My Mind’s Eye. We’ll be back tomorrow with previews of Annie’s new Moonlight Whispers images. See you then! Stamps: Kraftin Kimmie Stamps “O Christmas Tree” (Emilie’s Etchings) Ink: Memento Tuxedo Black Paper: Stampin Up Handsome Hunter, X-Press It Blending Card, My Mind’s Eye “Winter Wonderland” (6×6) Accessories: Copic markers (E00, E11, BV000, R20, E35, E57, E42, E43, R22, R24, R39, YG03, YG06, YG17, YG63, YG67, B91, B93, B95, BG72, BG70, BG10, C00, C1, C3), My Favorite Things Simply Scallops Die-namics, Zva Creative adhesive crystals. Finished size 5″ x 5″. Hi everyone! 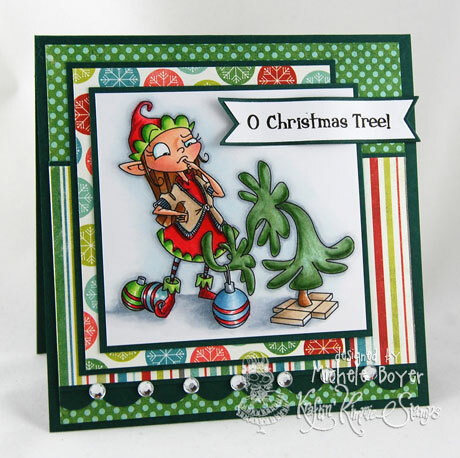 Today Kraftin Kimmie Stamps is previewing Cheryl Alger’s new set, Holiday Lulu and Libby, to be released Sunday, September 16. The set consists of three super-cute holiday images plus six coordinating sentiments. Isn’t Lulu adorable all decked out in her little Santa suit? I colored with Copics, adding in little dots on the hat and suit trim to help create a bit of texture. 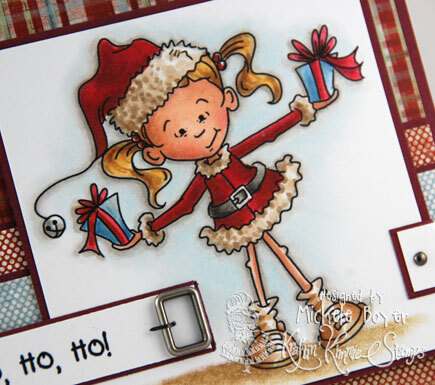 Stamps: Kraftin Kimmie Stamps “Holiday Lulu and Libby” (Cheryl Alger) Ink: Memento Tuxedo Black Paper: Stampin Up Bravo Burgundy, X-Press It Blending Card, My Mind’s Eye “The Merry Days of Christmas” (6×6) Accessories: Copic markers (E00, E11, E13, R20, Y21, E31, E35, R35, R37, R39, E39, E41, E42, E43, E31, E33, W00, W1, W3, BG70), Prismacolor pencils, My Favorite Things Dainty Lace Border Die-namics, Michaels mini brads. Finished size 5″ x 5″.